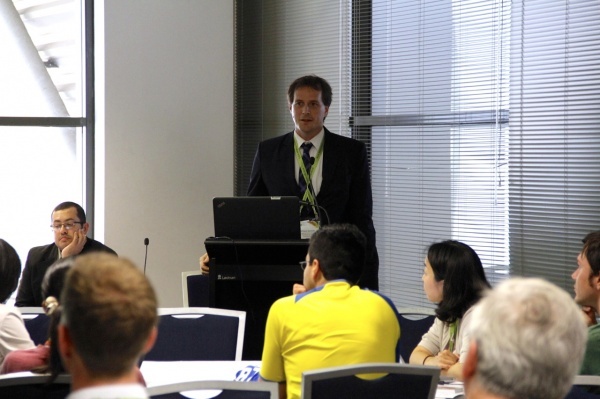 The United Nations University Institute for the Advanced Study of Sustainability (UNU-IAS) organized a side event to the IUCN World Parks Congress 2014 in Sydney, Australia in the evening of 13 November 2014. The event was titled “How does sustainability contribute to increase biodiversity conservation? Inspiring tools for enhancing sustainability”, and featured presentations by experts from UNU-IAS on tools to conceptualize, assess and incorporate sustainability into conservation. This event also included interactive practice in using the tools with participants. The event was opened by UNU-IAS Research Fellow Dr. Noelia Zafra-Calvo, who emphasized the importance of developing effective tools for analysis and decision-making processes. She then introduced the three tools that would be presented in the event: the first for a participative assessment approach to the economic value of wild living resources, the second for governance of a World Heritage Site, and the third being a toolkit for indicators for local communities to measure resilience in their production landscapes and seascapes. Dr. Zafra-Calvo then presented her tool, the participative assessment approach. She addressed issues in protected areas in terms of sustainable use of natural resources and conservation outcomes. Her tool measures monetary costs and benefits of the natural resource management system in three steps: first, a diagram of the previous usage of natural resources before commencing the conservation action is created; then, changes in usage after commencing the conservation action and their effects on local communities in terms of costs and benefits are identified; and finally, the monetary value of the changes is identified. The ideal situation involves interviewing the local communities. Dr. Zafra-Calvo illustrated this by introducing an actual case in which this tool was applied in Mozambique. Dr. Guilherme Cruz de Mendonça, also a UNU-IAS Research Fellow, gave a presentation titled “Connecting the ‘Culture and Development’ international debate to the protection of a Cultural Landscape World Heritage site: from UN General Assembly to local level management”, which introduced the role of culture and its importance in the sustainable development debate, particularly in light of the management of a World Heritage Site. He explained the negative pressures affecting the Olympic Park in Rio de Janeiro, Brazil, and local communities’ strategies to mitigate these impacts. Strategies identified included building partnership between universities and local communities, using social networking, and supporting justice issues. The final presenter, Mr. William Dunbar, Communication Expert at UNU-IAS and the Secretariat of the International Partnership for the Satoyama Initiative (IPSI), then introduced the Satoyama Initiative and the toolkit for the indicators of resilience. The Satoyama Initiative is a global effort to realize societies in harmony with nature by mainstreaming biodiversity into production landscapes and seascapes. The Toolkit for the Indicators of Resilience in Socio-ecological Production Landscapes and Seascapes were developed as a collaborative activity under IPSI between UNU-IAS, Bioversity International, UNDP and the Institute for Global Environmental Strategies (IGES). The indicators are a tool for local communities to assess and consider their own resilience, based on their perceptions of their landscapes or seascapes, and the toolkit is a practical tool for employing the indicators in the field. After the introductory presentations, workshop participants were divided into three groups, and the three presenters rotated to each group for practical applications of their tool and discussions. The event was attended by around 30 participants in total, allowing for a fruitful discussion in each of the three groups. 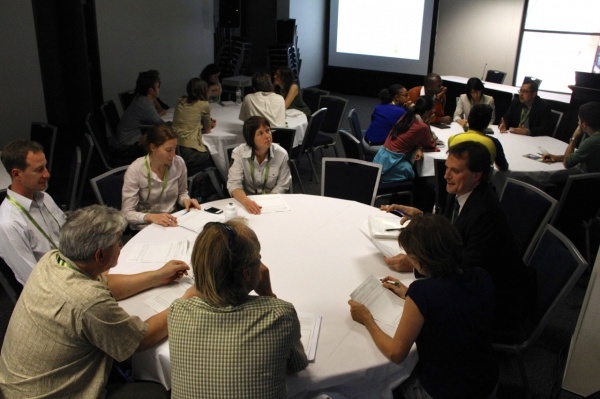 Participants showed a great deal of interest in all of the tools, and many said that they had received interesting ideas for management of their own protected areas.